Welcome to the Fort Smith Martial Arts Center web site! We are a black belt school and a family martial art and we are proud to serve Fort Smith and surrounding areas. As a Family Martial Arts Center, we hope to impart positive values in our students through the traditional martial art of Mu Sool Won. Our instructors are dedicated to the development of our students’ mind, body, and spirit in a supportive and safe environment. (Mu – Military/Martial/War Like, Sool – Art/Skill/Style, Won – Academy). Nations have always defined themselves by their armies and the wars fought for either conquest or defense. 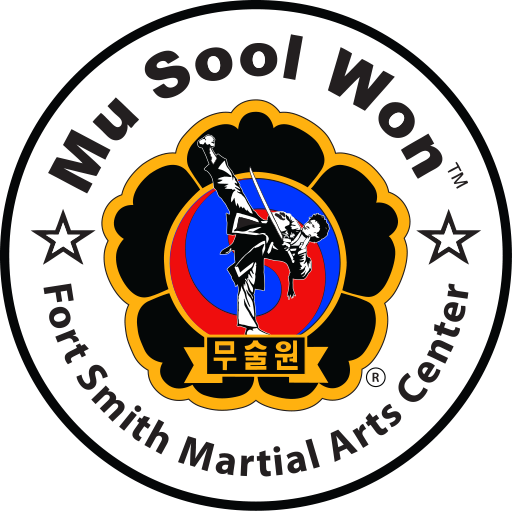 Mu Sool Won is a specialized combative art focusing on effective self defense and strives to take the best military tactics of both ancient and modern Korean martial arts and combine them into one comprehensive course. The system itself has countless techniques derived from traditional Korean martial arts and is structured to take the practitioner in a logical progression from the beginning all the way up to Master level. Mu Sool Won is a “no frills”, yet diverse system that includes everything from kicking, striking, trapping, locking, throwing, pinning, grappling, stick, knife, and gun disarms as well as traditional weapons and training methods. Training in Mu Sool Won develops a high level of physical fitness and self confidence to meet the reality of self defense, as practiced by the South Korean Military Forces. Though this is a self defense based system the values and effectiveness found in traditional martial arts are the foundation upon which this dynamic martial arts system was built and continues to evolve. This makes Mu Sool Won a traditional martial art with a very modern approach! The art of Mu Sool Won is first, and foremost, a military martial art designed to effectively defend oneself against attackers ranging from standing defense, grappling defense, and weapon defense. However, our art is not a complete martial art due to our vast array of kicking, punching, grappling, weaponry, and breathing techniques. We are a complete martial art due to our commitment to excellence; our effort into making each future black belt a true martial artist, and because we each strive to become better people through our training. Fort Smith Martial Arts Center (FSMAC) was founded in 2008 by Owner and Head Master Joshua White to spread the martial art lifestyle and make a positive impact in the lives of his students. The vision for FSMAC was to offer world class martial arts instruction for self defense and fitness in a safe, friendly atmosphere where people of all skill levels can benefit from training. FSMAC was opened to empower the community of Fort Smith by teaching children, teens and adults the confidence, leadership, self defense and fitness that can only be achieved through the practice of martial arts. Having studied martial arts for 25 years (training in arts such as Kuk Sool Hapkido, Krav Maga, Brazilian Jiu Jitsu and Muay Thai), Master White has created a program designed to reach all ages in a systematic and exciting way that teaches both effective self defense as well as unique and creative fitness routines. FSMAC offers two outstanding martial arts programs: Mu Sool Won and Brazilian Jiu Jitsu. In our Mu Sool Won program our kids, teens and adults will get to learn the dynamic martial art of Mu Sool Won, a system that encompasses all aspects of martial arts such as kicking, punching, throwing, joint locking, break falls, effective self defense, both modern and traditional weapons as well as fitness, while all being taught in a family friendly and non competitive environment. In our Brazilian Jiu Jitsu program our teens and adults will learn the world famous martial art of Brazilian Jiu Jitsu, an art made famous by the Gracie family and the UFC for it’s effective grappling and submission techniques. Used by military and law enforcement personal alike, our BJJ program will take you through the fundamentals of grappling and self defense in a fun, friendly environment.